Short Info: AAI result 2018 has been declared by the Airport Authority of India. There are 908 vacancies in AAI Recruitment 2018 for Junior Executive & Manager post. AAI recruitment applications have made from 16th July 2018 to 16th August 2018. Candidates who have participated in AAI Junior Executive examination are able now to check AAI Junior Executive Result 2018. Appeared candidates can check their vacancy details from www.aai.aero recruitment 2018. The AAI Junior Executive Information Technology Result 218 is available on the official website. AAI has conducted AAI Manager & JE Examination 2018 on 29th November 2018 to 3rd December 2018. Applied candidates who were going for the written examination need to download their AAI Admit Card 2018 to participate in the JE & Manager written examination. Now, the Airport Authority is going to tell the appeared candidates about their AAI Junior Executive Result. Appeared aspirants are able now to know about their selection in AAI Result PDF. The applicants who have passed the written examination will call for the further selection process. You can check your result from the official website now and after that, make sure about your selection. 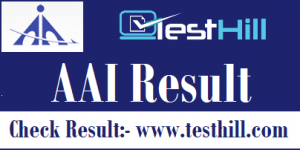 AAI Result PDF is individual as per post name. We are going to provide each suitable link to check JE (Commercial), JE (Corporate Planning & Management Services), JE (Airport Operations), and Junior Executive Information Technology Result 2018-19.